Park Plaza Hotel - Cardiff HotelThe Park Plaza is a luxury four star contemporary styled hotel located in the heart of the city centre. 129 stylish fully air-conditioned guestrooms including mini-bar, lap top safe and free high speed internet access. Dine in the Laguna Restaurant and experience our Rosette winning Executive Head Chef creative menus. Experience 'Style in the City' at Cardiff most stylish hotel! Our state-of-the-art Laguna Health and Spa features a stunning ozone friendly swimming pool, spa bath, a large gym and a steam room. Elemis Spa treatment rooms with a relaxation lounge with a range of treatments are also available. 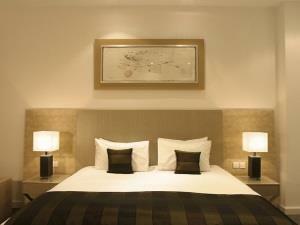 The Park Plaza is a luxury four star contemporary styled hotel located in the heart of the city centre. 129 stylish fully air-conditioned guestrooms including mini-bar, lap top safe and free high speed internet access. Dine in the Laguna Restaurant and experience our Rosette winning Executive Head Chef creative menus. Experience 'Style in the City' at Cardiff most stylish hotel! The ground floor Laguna Kitchen and Bar serves both local and international cuisine using fresh local produce. Guests are able to enjoy their meal on the terrace in the warmer months with views over the Civic centre.